Imagine a magical place that gathers together 17 million of the most passionate readers who want to talk about, review and buy your book. A place that not only allows, but encourages, both new and established authors to promote their books. create an author presence, connecting your book, your blog and your social media platforms. Now imagine if Amazon purchased this magical realm of high quality, book-buying, book-loving influencers in the spring of 2013, likely leading to big opportunities to align your Amazon marketing to this Utopia. If such a paradise existed, would you want to be a part of it? Ok, perhaps I’m overselling a bit, but certainly you can see the potential in incorporating Goodreads–the fastest growing platform for influencers in the writing space–into your book marketing and platform building strategy. Not only do you have a way to connect with passionate readers and influential people in the industry, but a path is also provided for those readers and influencers to discuss, share and promote your work. And as a preemptive strike against the groans of “Not another social network!”, consider this: where Twitter and Facebook provide access to the masses, Goodreads provides access to insatiable readers, book bloggers and book buyers. It’s definitely worth a little effort up front to become a part of this community and generate ongoing promotion for you and your books. As potentially one of the most important places for an author to spend time on line, Goodreads is not just for fiction writers. There is a growing number of non-fiction titles (some of them world-wide bestsellers), and there is unquestionably an audience for them. And to dispel another common misconception, Goodreads is not just for physical books. Ebooks are also popular, and although not all books are available in digital form, the library is growing dramatically. Despite the enormous potential for authors, the unfortunate truth about the Goodreads site is that it isn’t the most intuitive of platforms. Many of the features are hidden, and some are more than a little confusing to use. Authors often find themselves grappling around with the basic offerings, and often miss out on the most valuable aspects of the site and member base. 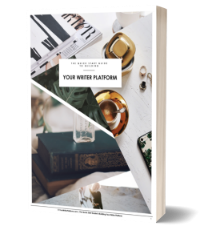 So to make things a bit easier–and because there is such great potential for authors building their brands and platforms–I have simplified the process from sign up to book promotion below. Go to www.goodreads.com to join Goodreads. Create your free (reader) account. Enter your full (published) name, email and password to join. Note: Currently, there isn’t a way to link two names to one author profile (eg. a pen name), so you can choose one of two options: 1) create a separate account for your pen name or, 2) add your real name as a second author to one Goodreads account. Click ‘Sign Up’. An email will be sent to the account you used, asking you to verify your email address. Click verify email. Add friends. Find your friends on Goodreads via your social media or email account. Select genres. Choose your favourite genres, but be strategic. Keep interests centered and relevant to your brand. Add books to your shelves. Books you’ve read, want to read and are currently reading. Join groups or create your own. Again, be strategic: choose groups that strengthen your image or brand. Participate in book clubs, discussions, and topics of interest. Add value to the conversation; contribute. When you join Goodreads, your initial profile is as a reader. To access or obtain an author profile, follow the steps below to convert or merge your reader profile into your author profile. The Author Program is for any author who has a published book–including self-published authors, or authors from other countries. If you are a writer but do not currently have a published book, check out the writing section of your profile where you can post your writing by genre for other members to read and review. Now that you have a reader profile, you must merge it into your free author profile by claiming your book or by entering it manually. search for one of your books and click on your published author name located just under the title of your book. It usually takes 24-48 hours before your author profile is merged. Once it says “Goodreads author profile” in the top right corner, you’re in! If your book is self-published or is not yet in the Goodreads database, you will be asked to manually add it. They will be able to add your book or give any additional direction. The process to log in doesn’t change after you’ve signed up for the Author Program (you will still use the same username and password). Your user profile will now point to your author profile. Finally! You are now a Goodreads Author which allows you to engage with your readers by sharing your recent reads and favorite books, publicize upcoming events like speaking engagements or book signings, add book excerpts and even video to your author profile. Click your name in the upper right hand corner to go to your author profile. Add an image, either your book cover or a professional photo of you, your bio and your blog URL. Link your RSS feed so that your blog posts are automatically updated. Paste your feed link into the ‘external blog feed URL’ section– your feed should look something like feed://www.yourwriterplatform.com/feed/. Embed YouTube or other videos. Add book trailers or talk about your book, your research or additional details, characters, influences or other important or interesting tidbits. Add your book(s) to your shelf. Click on the ‘want to read’ green bar, add to ‘to read’ shelf, click the stars and rate it. It will then be added to your ‘read’ shelf. (Hover to add to a particular shelf). Update your fans with status updates. Add your events and invite your Goodreads friends to attend. The more completely you fill out your author profile, the more compelling your offering is to your future readers. Missing or blank sections, no photo or outdated info on your author profile will not induce trust–or support–from potential readers. 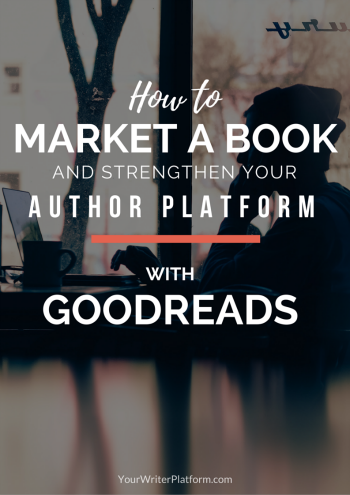 With a beefed up author profile, you can leverage the free resources and tools provided by Goodreads to strengthen your author platform and build your reader fan base. The Author Dashboard contains many useful links: you can get book statistics, upload a free ebook or excerpts, and utilize free widgets and buttons to add to your author website or blog. Be active! Update feeds, leave useful or insightful group comments, vote in polls, include blog and book updates, and give/ask for reviews. Click on ‘Groups’ and search for groups that read books in your genre. Click on the group name you wish to join, click ‘join group’, select your email settings (‘none’ is best to avoid being swamped with email notifications), and then click ‘ask to join’. Participate in groups as a reader first, and make sure you read and understand the group rules. Your goal is to add to the discussion, not detract from it with spammy comments and blatant self-promotion. Safe guard your author brand and image by expressing your courtesy, not your hustle. Try to have your book added to the community or group bookshelf–ask a moderator, or check the group’s rules for guidance. Get involved and establish your expertise in a particular genre or topic. Answer questions, fuel discussions and provide a unique or fresh perspective. If acceptable, promote your free promo days. Participate in the polls. If the group chooses a Book of the Month, they will vote for it via the poll–if your book is voted Book of the Month, it will likely be added to the group shelf. Ask for reviews, give reviews. You can promote your Featured Author Group on your other social networks, add videos and create polls to increase discussion and engagement. Tip: View all the members in a group and note the most active members–get to know these people! Remember, they have already self-selected themselves by genre, and active group members are usually ardent bloggers and reviewers! Find the ones with websites and follow their blogs, their reviews, and ‘Like’ and follow them on social media. If you support their work, they may be more inclined to support yours when the time is right. Now that you’ve made some possible connections, politely asking for reviews should be a little easier, and hopefully more rewarding. Getting reviews from people who are actually interested in your genre will also be more relevant and helpful to future readers–reviews from friends and family, less so (although still much appreciated). Added bonus? Reviews on Goodreads are generally more credible than those on Amazon, which can be manipulated. Reviews are critical to people’s buying behaviour, so nurturing relationships with influential people on Goodreads is time well spent. Use your Author Dashboard to post an excerpt. Consider adding a Goodreads Reviews widget to your author website to show off or coax more reviews. Or try adding another of the many free widgets or buttons available to your site to encourage your blog readers to check out your Goodreads profile. (Note: The more external widgets you add to your site, the slower it may load, so be selective). Make use of the relationships you worked hard to establish with your group members and politely request reviews when appropriate. You can review your own book, but for obvious reasons, this won’t carry much weight. So use it to post your inspiration for the book or anything else you feel should be shared with your reader about your book. A giveaway is a mini contest to win a physical book (no ebooks, currently) and a great way to generate advance reviews and create buzz for your book. According to Goodreads, the average giveaway attracts 825 entries, and over 40,000 people enter Goodreads giveaways daily. Combine advertising and social media with your giveaway and it can often have a viral effect. It is free to list your book in a giveaway. You can decide how long to run your giveaway, which countries are eligible to participate (reduce shipping costs) and how many books you want to give away. Start early. Build buzz and anticipation for your book by planning your giveaway three months prior to publication or your on-sale date. Run your giveaway for a about a month to let as many people as possible enter. Use the Goodreads giveaway widget on your blog or Facebook page and encourage your fans to enter. Linking your giveaway with Goodreads advertising can also be very beneficial (see below). You can have a giveaway at any time, not just when your book is new. Or have two for the same book, one prior to the release and then one on the release date. Advertising on Goodreads is a great way to target those book lovers who want to read your book. Giveaways combined with Goodreads ads increase entries by approximately 45%. Remember to add a call to action–like “enter to win” or “add to your shelf”–to increase engagement. Ads are a relatively inexpensive way to get your book noticed, and are especially effective if combined with a giveaway or other promotional strategies. What are your experiences with the Goodreads Author Program? Any additional tips that I’ve missed that will help grow your author platform and allow authors to bask in the Goodreads Shangri-La? A great and thorough guide, Kimberly. I have to admit I’ve only looked at Goodreads through the eyes of a reader up until now. maybe it’s because I’m not working on a book… but you’ve given those who are a lot to be excited about here. Good work! Thanks for this, Kimberley! Goodreads is a bit confusing and I’m going to bookmark this article so I’ll have a step-by-step approach to using is to its best capacity. Good idea! Goodreads really isn’t the simplest to navigate; now you have the map for when you’re ready to start! Thanks, Valerie! Glad to hear it! Great post Kimberly. For an author starting out at Good Reads this is a wonderful step by step guide to success. Thanks, Vickram! It’s a great ‘free’ way to get exposure, so hopefully now you can take advantage of some of the opportunities. Excellent 🙂 I’ve just started using Goodreads and am encouraged by this article. Thank you! Fantastic post, Kimberly. I had no idea Goodreads had all this potential. Thank you, thank you, thank you. I know, right? Like I mentioned, Goodreads isn’t necessarily the easiest site to navigate, but if you do a little digging, it can be a great resource for authors who take the time to tease out the perks. And since not everybody will take the time, you’ve just created another distinct advantage for your book and your brand! Good luck, Molly and thanks for stopping by! Thank you for an extremely comprehensive post, Kim. I’m on Goodreads, but I’m definitely not taking full advantage of it. I’ve got another book coming out in a few months, so it’s time to get on the ball! Glad I could help, Debra! Congrats and good luck or your new book! Send me an email after the launch; I’d love to hear how it goes. You are absolutely correct with all of your Goodreads promotion tips. I have used all of them and some are better than others in getting readers to add your books, rate and review them. The only thing I haven’t done was rate or add my own books. Some readers look down on that as they see it as an unfair way to boost your overall rating for that book. Thanks for adding a step-by-step list. I’m sure this will be mighty helpful for a lot of authors. Thanks for your comments, Leslie! There does seem to be a bit of discussion around rating your own books on Goodreads. Some authors think it’s tacky and skews the ratings, whereas others feel that as long as it is clear that it is the author’s rating, then there’s no harm. And some readers enjoy what the author adds in the review section, like a synopsis or what inspired them to write the book. My best advice would be to go with what feels right to you. Thank you so much! I’ve been wanting to do more with Goodreads but find it so difficult to work out how to…this is invaluable information. Awesome! Glad to hear it, Helena! Thanks for the detailed steps and know-how. I had been intimidated by Goodreads, but with some insight from this article I am going to dive in and really work to build my author brand. Your welcome, CJ! Goodreads is a little tricky to get a handle on, but it’s definitely worth the effort for most writers. Good luck, and thanks for taking the time to comment! Good luck with Goodreads, Rich! Let me know how it goes. Terrific post, Kimberly! I’m going to copy and spread the link to all my baby boomer friends who have given up on Goodreads because of the tricky navigation. I’m going to try the advertising portion of the site, so your tip about the call to action about my book’s giveaway is a great idea. Let me know how things go for you if you do the giveaway; I’d like to hear your results! Thanks for the great article, Kimberly. It comes at a great time for me because I’m just wading through all of this, having my first giveaway, and paid for some advertising. However, I’m not doing something right because even though people are signing up for the giveaway, I’m not getting any clicks, and therefore, Goodreads isn’t using any of my advertising money. (I honestly don’t even know what a click is.) I’ve tried to email a few of the moderators and haven’t heard back. I read somewhere that you only name a few genres that might be interested in the book, so I’m going to go edit the ad and see if that works. I think I’ll post my question somewhere on GR and see if anyone else has any ideas. Another great resource I’ve found on running a Goodreads giveaway is an article by Emlyn Chand at Novel Publicity, here. Great information Kimberly. I am thinking about Goodreads in a whole new way. Thanks! That’s great, Nick! Glad I could help! Excellent guide! I’ve been looking all over for a comprehensive guide on how to add an eBook! Very informative. Thanks for this. This was an insightful article. Lots of both “nuts and bolts’ mechanical tips, as well as useful strategy tips. Great work and look forward to more. The other side of this coin is that Goodreads needs to get the trolling under control. This site can be a great place to promote your book, but it also has an ugly side where readers one-star EVERYTHING an author writes (even without reading it) for silly reasons: they don’t like the author’s personality, they think the content is objectionable even though they’ve not read the book, or they are kamikazi-ing an author who is writing in the same genre as one of their favorite authors. This needs to stop or authors are going to start leaving this site. Although I have not experienced it myself, I have heard about some drama and problems with book reviews. Any suggestions on how this could be resolved? I’ve heard about the drama, but seen none in my six years on Goodreads, although I can see the whole site is picking up with activity over the last few months. More and more people coming on, I guess. Gave away 25 books two weeks ago and three reviews have already been generated. I can see that five more people are reading the book, too, a feature on the Author Dashboard I like very much. One tip on the giveway: Do not include foreign countries if you are in the USA –not unless you want to pay about $9 per book for mailing. Even Canada. There is no media mail for overseas, there are forms to fill out, and the price is outrageous. Great tip on mailing, Jack! I’ve heard the same. Glad to hear that your giveaway was successful and that you haven’t experienced any of the negativity. Hopefully it gets sorted before too many people are adversely affected. Great post. Question. I’m setting up a Goodreads Giveaway, and I see I’m required to supply books to winners on the date the giveaway ends. Does that mean I should end my giveaway on my publication date, March 11? Goodreads suggests that I keep the duration short, say a few weeks. If this is the case, then should I wait until a few weeks before March 11 to start my first giveaway? Hi David! Great question! Goodreads recommends that you run your giveaway approximately one month prior to publication, but you also want to try and end on a non-popular day if you can (i.e., look through the list of giveaways and find a date where you will have less competition and therefore, greater exposure). Plus, your book already has to have a page on Goodreads that includes an ISBN for you to run a giveaway for it. If your book is already on the site but doesn’t have an ISBN on its listing, contact the Librarians Group for help. This was very helpful. I signed up for the author page as I was reading this article. It was very step-by-step. I am interested in the giveaways and getting the book out there. Sounds good, Robert! Let me know how it goes. Kimberley, this is a great article. I hope you have converted it into an ebook and put it out on Amazon.com! I am sure you can reach some folks there who may not see your post here – and it may earn and little coin for you too. Keep up the good work. I bookmarked your article so I can go the rest of the way through it, step-by-step, as soon as Goodreads establishes my author account. Awesome, Tom! Let me know how things go for you on Goodreads. Wonderful information. I’ve not been very active in GR after claiming my author profile (someone had already put it and my books up). You mention “Update your fans with status updates” as something that can be done from the Dashboard. How can that be done other than through our own blogs (which I think Fans see, correct?)? I believe Events go only to Friends. How can we reach those who’ve joined us as Fans? 1) Add a book to your shelves or write a review of it. There will be a box you can check to add to your status updates. 2) Post progress updates on the books you are reading by visiting the book’s page (or your main GoodReads stream) and click to update your progress. 3) Broadcast a public message as a status update. Once on your author profile, scroll to where other users can leave comments on your page, and leave one on of your own. Excellent Article, Kimberly! Thank you. I have a novel coming out late spring or early summer. This really helps. Thank you for #3! I had no idea that was there. Sadly, there was a message I never saw.